Leadership and Team Building (LTB) is a core module offered as part of the business program in the Singapore Management University (SMU). Through the comprehensive teaching of principles, theories and skills, LTB aims to empower students to mould their own personal experiences of leadership and team building in their lives. The SMU LTB team were troubled that classroom engagement amongst students was not at its prime. GameLead’s aim was to make learning much more fun, exciting and easy for students through gamification. 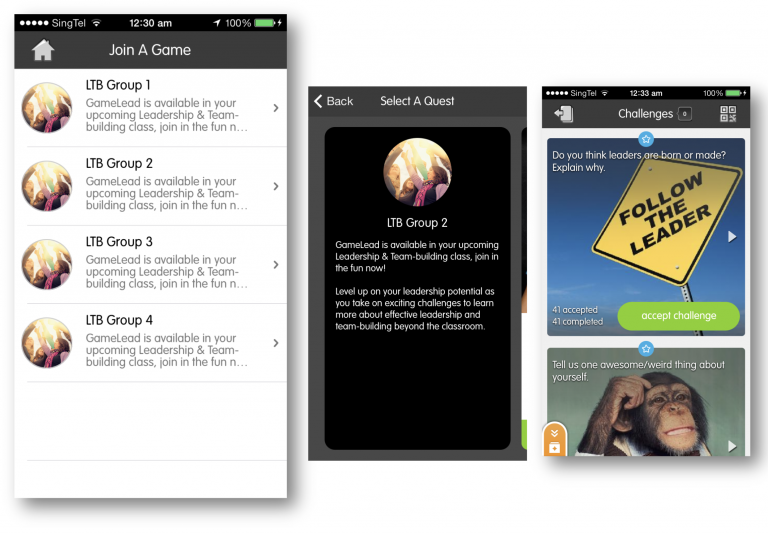 Professor Tan and her team of talented Teaching Assistants (TAs) used the Gametize platform to create GameLead, a gamified experience to value-add learning for LTB. GameLead was made available on both web and mobile to be played by students wherever, whenever! One Topic would unlock per week over a course of 9 weeks. Each topic consisted of a series of simple challenges, from photos, quizzes, and videos prompted students to reflect on and apply what they have learnt in class. 61.9% of students felt much more engaged in LTB due to GameLead. This was rooted in the collaborative learning environment that the social interactive features of GameLead created. Mobile access also enabled them to review and reflect on key learning points beyond the classroom. Students felt that content introduced through challenges were interactive, interesting, and relevant to the theories learned in class. As a mobile platform, such content could also be accessed anytime at their convenience! Overall, 97.3% of students recommended the use of GameLead for LTB in the future by the end of the semester. “[What I found most useful] was the function that allows us to view your classmates’ answer and see multiple perspectives from different angles. Knowing how others think and openness to their experience is something that can enrich our learning experience."